I live in Florida, and was, therefore, surprised to see that Florence Nightingale was running against Thomas Jefferson on my last sample presidential election ballot. While nurses on every continent know that Nightingale invented nursing as a profession, that before her, nurses were regarded as loose women no better than drunkards, slatterns, or opium addicts, most Americans know little about her. Throughout the old British empire, by contrast, she is recognized as an iconic heroine, the “Lady with the Lamp.” That epithet derives from the fact that she made rounds at night to tend the wounded soldiers in the hospital at Scutari during the Crimean War, a revolutionary practice at the time. But who is the real Florence Nightingale, the woman behind the postage stamps and china figurines and nurses’ oaths? I had only a hazy idea of her myself when I began my novel The Twelve Rooms of the Nile. In fact, initially, the novel was going to be about Gustave Flaubert’s adventures in Egypt. But early on, I discovered that Nightingale also traveled the Nile at the same time. In fact, on November 25, 1849, they both boarded the same overcrowded, flea-infested boat to be ferried from Alexandria to Cairo to the navigable portion of the river. Flaubert recorded seeing an English woman wearing a “hideous green eyeshade attached to her bonnet,” and we know that Nightingale wore such a contraption. In Cairo, they rented separate houseboats, called dahabiyahs by the English and canges by the French. It’s important to remember that this happened before Egypt was a popular tourist destination, before there were Cook’s Tours, steamboats, and the telegraph, before there were any Egyptian museums. European visitors often brought hammers and chisels so they could chip off pieces of a pyramid or temple. Both Flaubert and Nightingale took home such souvenirs. (One of his was the foot of a mummy that he dug out of a tar-pit). Their itineraries were virtually identical. They both visited the pyramids, negotiated the cataracts at Aswan, spent time at Abu Simbel, Kenneh, Esneh, Luxor, and Philae. Alas, they never met. On the surface, the two seem very different. He was a louche character who loved language and prostitutes with equal dedication and vigor; she was a naïve do-gooder who believed God had called her to be of service to the world. There were also enticing similarities. Both were ebullient and rebellious, disdainful of their bourgeois backgrounds. Both had a crackerjack wit. Most important of all, both burned with ambition and believed themselves to be failures. He had just written his first novel, The Temptation of Saint Anthony, which was pronounced a disaster by his literary coterie. She had just refused her only serious marriage proposal, much to her family’s disapproval. At every step her family had blocked her desire to be of use—to work in hospitals or schools for the deaf, even to study mathematics. In short, two frustrated geniuses boarded that boat in Alexandria, believing that travel through Egypt would somehow “cure” their depression and reveal their destinies. It took me seven years to write this book, much of that time spent researching the two main characters. Fortunately, both left massive written records of their lives. If you have not read Flaubert’s voluminous letters, you are in for a treat. Nightingale also wrote thousands of letters. But her missives home from Egypt often masked or omitted her true feelings, which she recorded instead in her personal diary. She was, on occasion, suicidal. He was equally despairing, but countered his misery by indulging his appetite for women, drink, and food. The more I learned, the more convinced I became that their appearance on the same flea-infested boat was not a mere coincidence, but rather evidence of a deep connection in temperament and character, and a strong historical basis for the fictitious friendship they develop in my novel. Flaubert decided early on that he would never marry. After agonizing over whether to accept her only suitor, Nightingale wrote in her diary the famous words, Now, no more love, no more marriage. She remained steadfastly opposed to matrimony for the rest of her life, abhorring the limiting role of women within the family. For all his bluster, Flaubert was one of the great sensitives of the world, a man who could be acerbic in writing, but never unkind in person. They both embraced the Victorian ideals of politesse and compassion. There is no record of Nightingale or the others in her party taking note of Flaubert on that boat ride, but that did not disturb me in the least. By then I was hooked. All I could think was how amazing it would have been if these two geniuses had met. In the end, I wrote the book because I wanted to see what would happen when they did. Entry is easy: leave a comment on this post by midnight Wednesday, October 31 (email not necessary in the comment, but please give it when asked, so I can get back to you if you win.) If you want a second entry, sign up to follow the blog or indicate you’re already a follower. For a third chance, repost this giveaway on your Facebook, blog, Twitter, website, etc. and post the link in your comment. Don’t worry if your post doesn’t appear immediately, because I moderate comments and don’t spend my life at my computer. I’ll randomly select the two winners and announce it on Thursday, November 1. Good luck! I’ll be in touch shortly for mailing information. Thanks to everyone for participating! I am very excited about this book! Florence Nightingale was one of my first heroine figures! I read a bio that went into a great deal of detail on the Crimean War and the reactions of her family, clear back in junior highschool. I’d likely be off to B & N to buy it now, but I will be book broke until after the Yuletide….so little time, so little money, lol, and so many gifts to make/buy! But it has been added to my list for after the New Year! Hi syrbal! I checked out your blog a couple of days ago when I noticed a “referral” from your site on my stats. Nice work! Good luck in the drawing and thanks for adding me to your blogroll! Oh, I’ve had you there forever, Faith. I had a blog on blogger before under the name Herlander Refugee, and I had you blogrolled there, too. I always look forward to your discussions, especially on books. I came here via a link from Goodreads and so glad I did! I have very much been wanting to read this book and the interview was great! Seven years in the making and love the premise. However, I am so happy to have fallen across this blog! Fantastic! Thanks again. I have been very interested in this book since I heard about it a few months ago. Would love to win a copy! I am going to sign up to follow your blog too! I have this on my list of books to read. I’ve always been interested in learning more about this period. 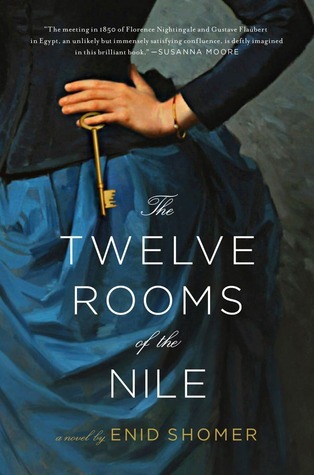 Just read about The Twelve Rooms of the Nile on librarything.com. It sounds fascinating and it’s definitely going on my TBR list! It would be nice to win a copy! i just recently began reading historical fiction and find this an intriguing idea, Not very familiar with these figures though I did read read ‘Flaubert’s Parrot’ years ago. Thank you, the book came last week…I have been ill and didn’t get to the post office to collect it!